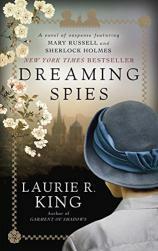 Laurie R. King’s New York Times bestselling novels of suspense featuring Mary Russell and her husband, Sherlock Holmes, are critically acclaimed and beloved by readers for the author’s adept interplay of history and adventure. Now the intrepid duo is finally trying to take a little time for themselves --- only to be swept up in a baffling case that will lead them from the idyllic panoramas of Japan to the depths of Oxford’s most revered institution. After a lengthy case that had the couple traipsing all over India, Mary Russell and Sherlock Holmes are on their way to California to deal with some family business that Russell has been neglecting for far too long. Along the way, they plan to break up the long voyage with a sojourn in southern Japan. The cruising steamer Thomas Carlyle is leaving Bombay, bound for Kobe. Though they’re not the vacationing types, Russell is looking forward to a change of focus --- not to mention a chance to travel to a location Holmes has not visited before. The idea of the pair being on equal footing is enticing to a woman who often must race to catch up with her older, highly skilled husband. Once in Japan, Russell’s suspicions are confirmed in a most surprising way. From the glorious city of Tokyo to the cavernous library at Oxford, Russell and Holmes race to solve a mystery involving international extortion, espionage and the shocking secrets that, if revealed, could spark revolution --- and topple an empire.